Steven (Chicagoland, United States) on 1 October 2014 in Architecture and Portfolio. Designed by architect Frank Lloyd Wright, the Rollin Furbeck House was a wedding present for Rollin Judson Furbeck from his father, Warren F. Furbeck, in 1897. Rollin was the third of five sons. That same year, Warren also gave his first son, George, a Wright house located in Oak Park as a wedding gift. According to the May 7, 1897 issue of the Oak Park Vindicator, Judson L. Wapples sold the land to his son-in-law in 1896, and construction began the following spring. The land was purchased for $2,250, and the house was built for $6,000. 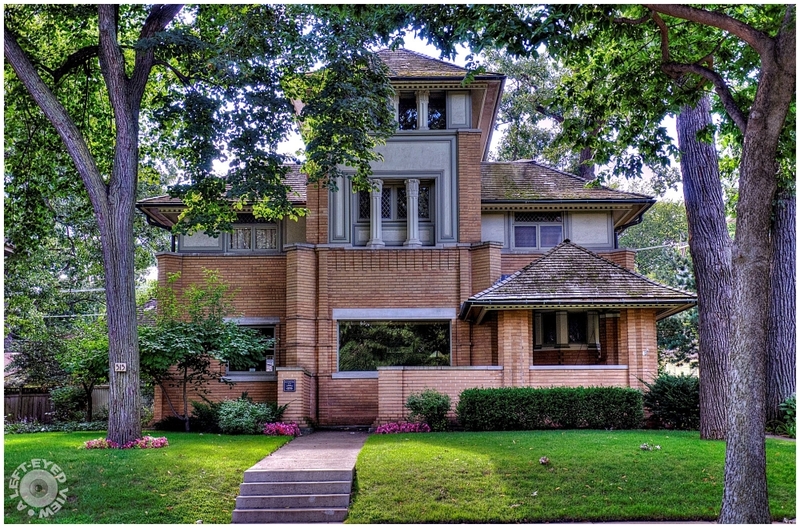 The home is located in Oak Park's Frank Lloyd Wright Prairie School of Architecture Historic District, which is listed on the National Register of Historic Places. In 2003, the home was designated a local landmark by the Historic Preservation Commission. The dramatic facade and pronounced three-dimensionality of the design combine to give The Rollin Furbeck Residence its imposing presence. The house was executed during a period in Wright's career spanning the years of approximately 1897-1903 when he was experimenting with the construction of vertical elements (note the home's massive three-story center tower and vertical octagonally-fluted colonnettes) and the characteristic horizontal features that resurface so consistently in his subsequent works. The sheltering low-pitched hipped roofs with wide overhanging eaves, broad, central chimney, brick string courses and corbel table, window hood moldings and projecting sills of Bedford limestone (united by the brick string courses) and banded windows are all pure Prairie attributes emphasizing the horizontal. The house is considered a major transitional work for Wright as his previous designs (up until this point) were either square or rectangular. With porches protruding toward the east and west, and the Porte Cochere at the south end of the home (as seen in The Winslow House), the Rollin Furbeck House demonstrates a departure from the predictable, to the establishment of Wright's more sophisticated cruciform and pinwheel layouts. The influence of Louis Sullivan is still apparent at this time, as seen in the stylized-leaf ornamentation of the capitals crowning the colonnettes (located in the stacked loggia-inspired areas of the tower). These Sullivanesque colonnettes are not structural. The house exudes a Japanese quality like so many other Wright designs. The sixteen-sided star columns of brick add architectural interest to what is believed to be one of Wright's last uses of an opened semi-detached front porch entrance. The art-glass light fixtures on the front and enclosed back porches were commissioned by the present owners, and are in keeping with the architectural integrity of the house. The Rollin Furbeck House can be likened to a frozen architectural time frame in the evolution of Wright's career......a visual preservation of the crucial turning point that represents his progression from early influences to the implementation of the essential elements that would become his mature Prairie Style. Photo captured August 30, 2014. Thank you for making me aware of all this - what an experience. Le deux tronc des arbres faont un super cadrage de cette maison splendide. Une maison impeccable, bien située entre les arbres pour ton cadrage. What a beautiful house here! Splendid architecture and interesting note. Thank you for sharing. This house is very attractive with the unusual high center tower. The history of the sons is very interesting. Wonderful shot of some beautiful architecture! i've come to really like this style and its distinctive features that you describe so well! The balance among the lit and the shadowed areas is fantastic. Beautiful arcitecture and a superb photo ! such beautiful frame, colors, lighting, textures & reflections! Really nice house. I like how you present these houses. Nice compositions. Such a lovely gift Warren Furbeck gave to his sons. This house is beautiful. I love the architecture and the Japanese influence. Very informative narrative. Lovely shot. The Japanese quality does shine out. Beautiful shot of this amazing house. This has a 'wedding cake' look to it, a more vertical appearance than most, and your detailed information is wonderful, Steven.